Have you made a wish for the New Year? How about doing it in village style in Hong Kong? The Lam Tsuen Wishing Tree is recommended for you if you’d like to try something new. 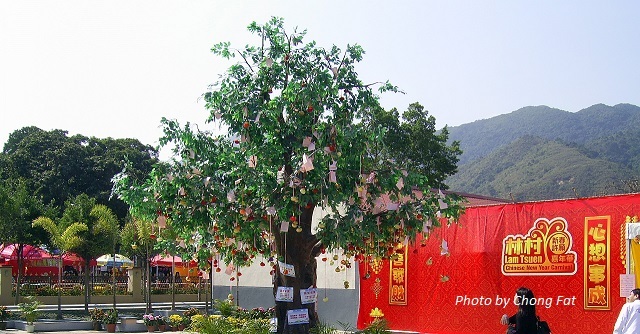 This famous Wishing Tree Hong Kong is located near the Tin Hau Temple in Fong Ma Po Village – one of the villages of Lam Tsuen, Tai Po in the New Territories. Every Lunar New Year after the Tin Hau Temple worship, villagers burn joss sticks and write down their wishes on joss paper tied to an orange. Then, they close their eyes, make wishes sincerely and throw the paper onto Lam Tsuen Wishing Trees. If the paper successfully hung on the branch without falling down, it is believed that the wishes will come true. There are also International Float Exhibition and Stage Performance. Originally, throwing joss paper onto the Lam Tsuen Wishing Tree was just a custom in the village. The custom was widespread after the broadcast of a TV series in 1998. A lot of tourists went to see the wishing tree. However, as the tree was overloaded, the trunk of it collapsed in 2005. At present, the Hong Kong Wishing Tree is the third generation. They are actually two banyan trees. Afterwards, the authorities have banned people from throwing joss paper on the trunk. Instead, wooden racks are set up for hanging the joss paper. In 2008, the tree was recovered. At the same time, the village office spent millions of dollars to build supporting facilities, include the building of the Wishing Stone and the Wishing Square. Since then, light-weight plastic oranges with placards have been used so as to conserve Lam Tsuen Wishing Trees. Just follow the same steps described above. The joss paper and orange set is prepared, so you don’t need to tie it up yourself. Don’t worry. You can buy them at the stalls there. The floats which taking part in the Chinese New Year Parade Hong Kong on the Chinese New Year’s Day will be displayed at Lam Tsuen Wishing Square during CNY. It has become a tradition to see the floats here since 2011. You can find various local snacks, special sea-food and traditional Hakka food at the carnival. Some of them are rarely found downtown. You can write down your wishes on a wishing lantern, light it up and then make it float on the Wishing Pool. Fee: HK$100-200 with lanterns and souvenirs. Families with new born babies are invited to celebrate by lighting lanterns in Lam Tsuen. Fee: HK$100-200 with lanterns and souvenirs. You can write love messages to your loved ones on wooden love locks. Enjoy the Hakka cultural performance from 12:00 to 16:00 on 16 Feb 2019. Participants have to share their dreams in less than 50 words or through a 15 second video. 10 winners will be selected and the organizer will help to make their dreams come true. Participants will send their photos to the organizer. Selected photos will be posted on the official Facebook of the event for the public to vote. The winning photos will have a chance to be printed as the Hong Kong Well-wishing Festival postcards. How to get to Lam Tsuen Wishing Trees? First of all, go to Tai Po Market MTR station or Tai Wo MTR station. 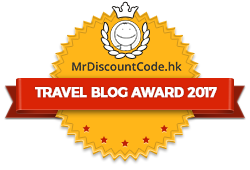 Bus 64K – Take the bus from Tai Po Market MTR station or Tai Wo MTR station, get off at Fong Ma Pobus stop. Bus 63R – Take the direct bus from Tai Po Market MTR station to get there. This special route is only available from 10am to 6pm, 5 to 8 February 2019. Minibus – Take the Minibus 25K from Tai Wo MTR station, get off near Fong Ma Po bus stop.